See where we are, what events we will be in, and when we are available with our easy-to-use Truck Calendar! Click on a Calendar Event to see the details. Listed below are the upcoming events where you will see the Dough Dough's Donuts Food Truck in action. If you wish to schedule Dough Dough's Donuts to be at your next event or request a quote, please click this link and fill out this form. I had your do-dog at the food truck invasion and I thought it might be too sweet for me, but I was exceptionally surprised that it wasn't and was tasty as can be. I was so intrigued I tried your loaded doughnuts with bacon, green onions, shredded cheese and sour cream. I can see why it has won you awards, awesome combination, great mix of flavors and served fresh and hot! DELICIOUS! Best cinnamon roll I've ever had this past weekend at the Boynton Beach Inlet craft beer event...SOOO delicious!! Visited you at Wellington Amphitheater tonight ~ after chatting with you about The King's Academy my family and I enjoyed your fresh donuts with powdered sugar and chocolate ~ WOW!!!! ~ what a treat! We were instantly addicted and will be visiting you next week at school for sure! Nice meeting you! I had your donuts for the first time ever, I am not a fan of donuts, but yours are simply amazing! I tried them on Saturday night at the Palm Beach Zoo. I was worth the long line. You are the best ever!!! Thank you so much for waiting in the rain for us!!! OMG! Your donuts are delicious! I recommend the cinnamon donuts. Once you have one-you gotta have more. People, next time you them, have a donut- you'll be back for more. Thanks guys! You can always find out where the Dough Dough's Truck will be at by visiting our Facebook page. 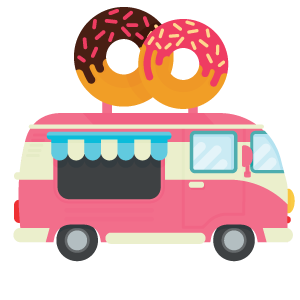 We have a family of Food Trucks - Click on one to learn more! To schedule Dough Dough's Donuts for your next event, fairs, parties, or carnivals, please use the form on our contact page. 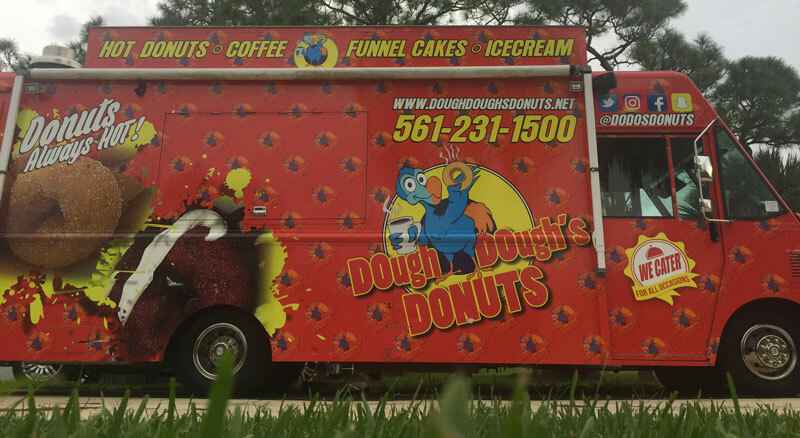 Looking to locate the Dough Dough's Donuts Food Truck? Stop by our Facebook page for the latest details and specials.